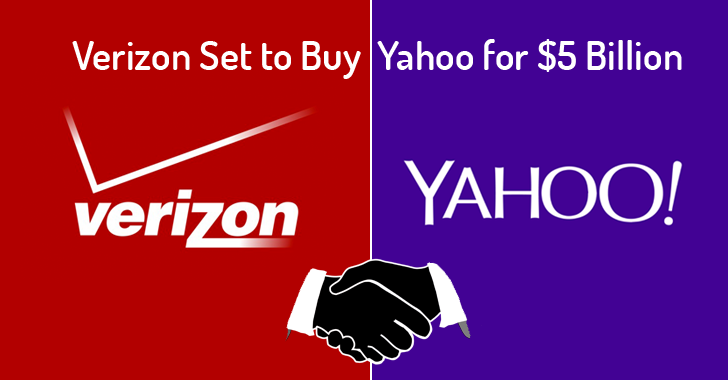 Verizon Set to Buy Yahoo for $5 Billion — Here's Why a Telecom is so Interested! Finally, Someone has come forward to buy Yahoo! Guess Who? Yes, Verizon Communications Inc. is reportedly closing in on a deal to acquire Yahoo’s core business for about $5 Billion, according to a report from Bloomberg. Since the agreement between the companies has not been finalized, it is unclear at this moment that which Yahoo's assets the deal would include. "In order to preserve the integrity of the process, we're not going to comment on the issue until we've finalized an agreement," a Yahoo spokeswoman said in a statement provided to CNNMoney. You might be wondering Why Verizon is buying Yahoo! Well, I’ll come to it in the second half of my article, because before discussing this point, let’s first focus on why Yahoo! wants to get acquired. Why Yahoo Was Up For Sale? Founded in 1995, Yahoo! was once the brightest star of the Web. But when its rivals including Google, Facebook and even few-years-old companies like Snapchat and WhatsApp have won over users, Yahoo! has not been able to maintain that glory. Yahoo! CEO Marissa Mayer - formerly a Google executive - has spent billions on acquisitions so far to improve Yahoo's mobile products, expanding its audience by acquiring Tumblr and doubling down on premium media content. But Mayer struggled to slow the overall ad sales decline of Yahoo! and failed. Last Monday, the company accepted that its revenue fell 15% in the second quarter, after excluding accounting adjustments, and its operating profit fell 64%. So, after keeping investors at bay for years, Mayer said Yahoo! would explore strategic alternatives, including selling its core assets. Verizon has long been considered a suitable buyer for Yahoo’s Internet assets, which the telecom giant wants to combine with AOL - the American global mass media corporation bought by Verizon last year for $4.4 Billion. Now, the two companies are in one-on-one discussions, and Verizon will reportedly acquire Yahoo! for about $5 Billion. Here's Why Verizon Wants to Buy Yahoo! So, why does a mobile telecom provider want to acquire the core editorial business of a failed Internet portal? With the success in the wireless industry, Verizon has been buying up Internet and ad technology companies, like AOL, to compete in a mobile advertising market dominated by two big players, Google and Facebook. And for this same reason, it is now buying Yahoo!’s ad and content businesses. Yahoo! has millions of users, and a collection of websites like Flickr, Tumblr, Yahoo Finance, and Yahoo Sports, including some digital-ad technology like Flurry and BrightRoll. Since the growth of Verizon’s traditional telecom business has been decreased, companies like Yahoo! and AOL would necessarily help Verizon make money from digital advertising on mobile devices. The deal would not only give Verizon a powerful collection of content and revenue from ad related to that content but also give the telecom company a considerable amount of user data to provide target advertisements to users by the telecom as well as others. So, this is the kind of deal Verizon was interested in when it acquired Yahoo!